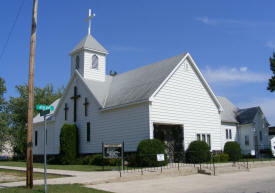 Do you have photos, historical accounts or other items pertaining to the Miltona area? Would you like to share this historical information with the world? 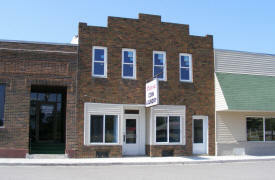 LakesnWoods.com would like to publish your Miltona photos (current or historical) or historical accounts on this website. Original materials can be returned and your privacy will be respected. 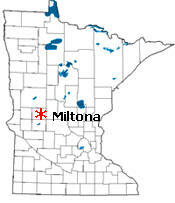 Miltona is a city in Douglas County, Minnesota. 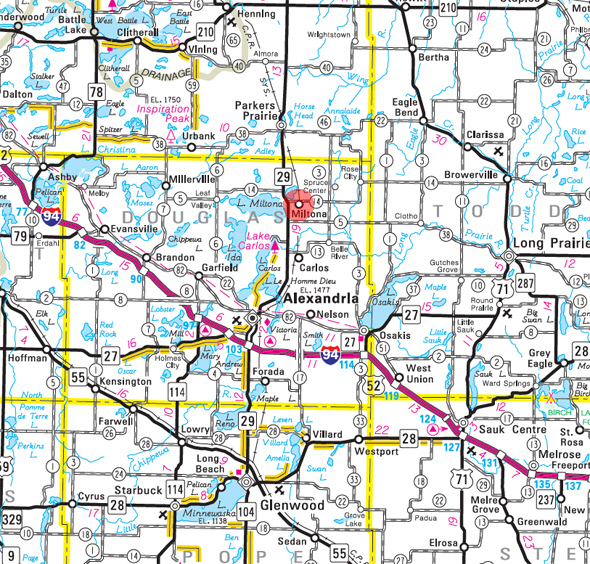 Minnesota State Highway 29 and County Highway 14 are two of the main routes in the community. 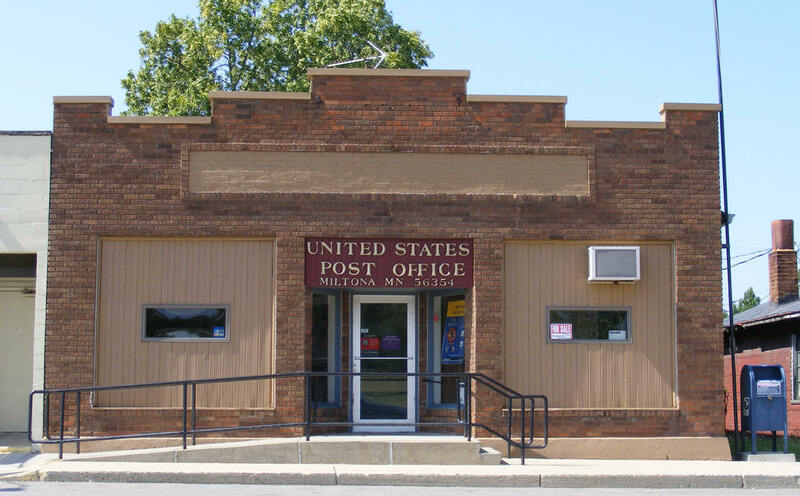 According to the United States Census Bureau, the city has a total area of 0.67 square miles (1.74 km2), all of it land. The elevation is 1,407 ft (429 m) above sea level. As of the census of 2010, there were 424 people, 165 households, and 112 families residing in the city. The population density was 632.8 inhabitants per square mile (244.3/km2). There were 184 housing units at an average density of 274.6 per square mile (106.0/km2). The racial makeup of the city was 99.3% White, 0.2% African American, 0.2% Native American, and 0.2% from two or more races. Hispanic or Latino of any race were 1.2% of the population. There were 165 households of which 39.4% had children under the age of 18 living with them, 50.9% were married couples living together, 10.9% had a female householder with no husband present, 6.1% had a male householder with no wife present, and 32.1% were non-families. 24.8% of all households were made up of individuals and 11.5% had someone living alone who was 65 years of age or older. The average household size was 2.57 and the average family size was 3.06. The median age in the city was 30.2 years. 30.4% of residents were under the age of 18; 8.8% were between the ages of 18 and 24; 28.6% were from 25 to 44; 18.5% were from 45 to 64; and 13.7% were 65 years of age or older. The gender makeup of the city was 51.4% male and 48.6% female. 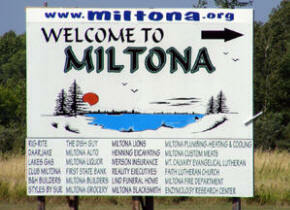 The city of Miltona, sections 25 and 26, was incorporated on March 31, 1930. It began as a station of the Soo Line on the northeast end of Lake Irene and was relocated to its present site when founder John Hintzen purchased land there during construction of the depot in the early 1900s. Although some sources say the city was named for the lake, others sources say it was named for an Indian chief who once lived in the area. 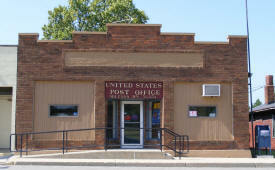 Its post office operated, 1873-85, 1891-1905, and from 1911. Join Miltona for their annual TORNADO DAYS celebration (third weekend in July), which commemorates the town’s rebirth after the 1970 tornado. Located just 13 miles north of Alexandria, the 2018 celebration will held on July 20, 21, & 22 with many activities, music and entertainment for the whole family. Our 18 hole facility includes a spacious clubhouse for your before and after needs. Our Proshop is stocked with golf balls, logoed clothing, shoes, golf bags and all of your golf accessories needs. Our Grill and Bar offers daily features as well as our full menu. We have frosty mugs with multiple varieties of dark and light beers. Walk out on the back deck and you can watch golfers come up nine. Take a few more steps and you will be on our 18 station practice tee and our 7,000 sq. foot putting green. 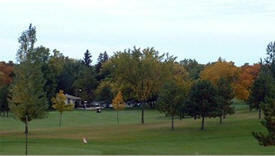 Our 2nd largest park at almost 97 acres, Spruce Hill serves as a gathering spot for residents of this rural township. It is used by groups for day outings, scout troops for 1 or 2 day overnights, and local softball teams for games and practice. There are 4 miles of easy cross country ski trails and the DATA snowmobile trail crosses the park. The woodlands are at their most accessible in the winter season. 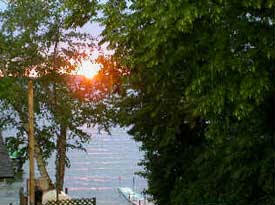 Tip Top Cove Resort is a Total Family Resort located in scenic Lake Miltona, the largest lake in Douglas County. 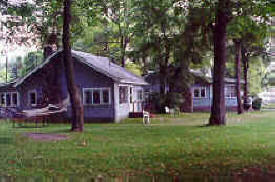 We offer modern, spacious cottages on park-like grounds. The sandy beach is good for swimming and safe for children. We provide clean, comfortable accommodations with friendly, courteous service. There are 9 fully furnished housekeeping cabins, ranging from 2 to 6 bedrooms. Most of them lie along the beach. 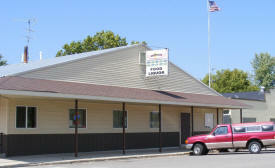 Our Lodge features Motel Rooms and two, three or four bedroom Suites, a lounge area with intimate seating arrangements, a large stone fireplace, big screen TV, internet access, game room, laundry facilities, meeting room and gift shop. 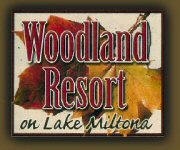 We welcome you to vacation with us on beautiful Lake Miltona, near Alexandria. Where the fish are abundant, the sunsets are magnificent and your deluxe cabin or vacation home awaits you. There are activities for the entire family: swing at the playground, build a sand castle at the beach, take part in a fishing contest, or just relax the day away swinging peacefully in a hammock. 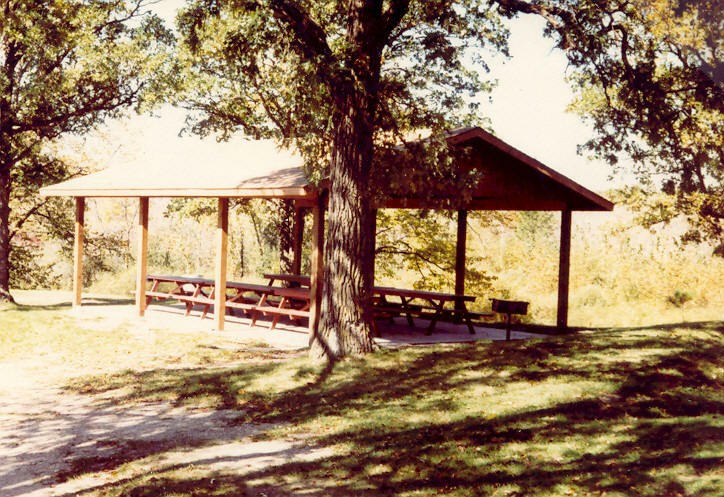 If you are looking for great family camping, then this is the place! 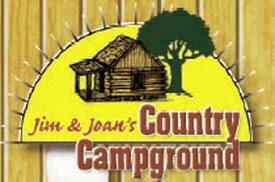 The 35-acre campground has 99 large (50' x 70') full hookup sites including 10 pull-through sites. 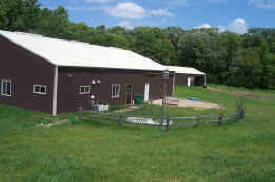 All sites are nice and level with lots of green grass. B & H Builders is a full-service general contracting firm built on years of experience and commitment to client satisfaction. Founded in 1977 B & H has a strong "Family Tradition" way of business that has been reinforced with the establishment of B & H Builders, LLC, we are proud to continue the fine general contracting performance that was originated over 30 years ago. 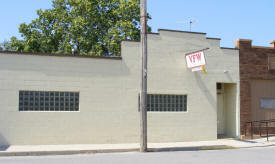 19 years experience serving laundry, cooking, dishwashers and refrigeration appliances. Serving the local area for the past 8 years. Complete lawn service – Mowing, Fertilizing, Weed/Insect Control. Parts and sales, Service, Rental of lawn mowers, riders, farm & utility tractors, ATVs, Snowmobiles, RVs, etc. Locally owned total propane company. Tank sets, Gas checks, Modern equipment. All employees CTEP certified. Pre-buy program. Satellite sales, service and installation. New TV sales. UNICEL cellular phones, sound systems, security systems, new construction pre-wiring and all electronic needs. 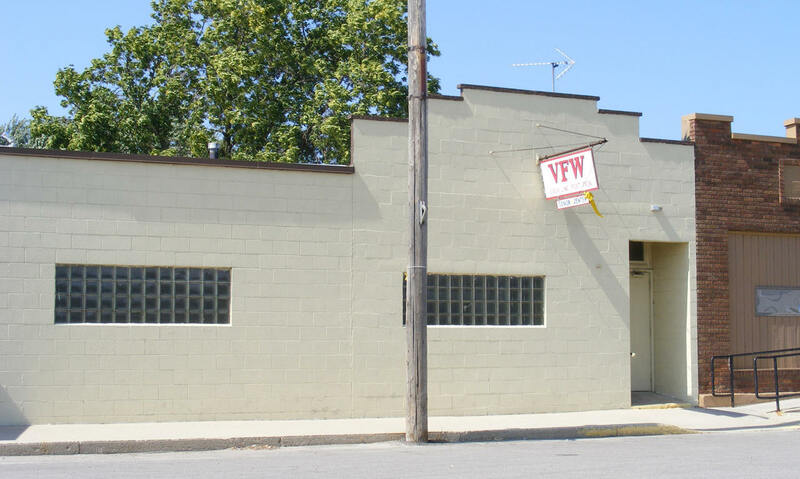 For 20 years we have worked hard to remain a top-of-the-line full service lumberyard. 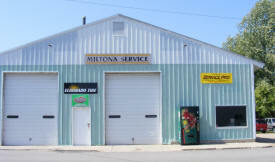 At Miltona Builders Supply we use our experience and knowledge to make your projects energy efficient, affordable, and beautiful. 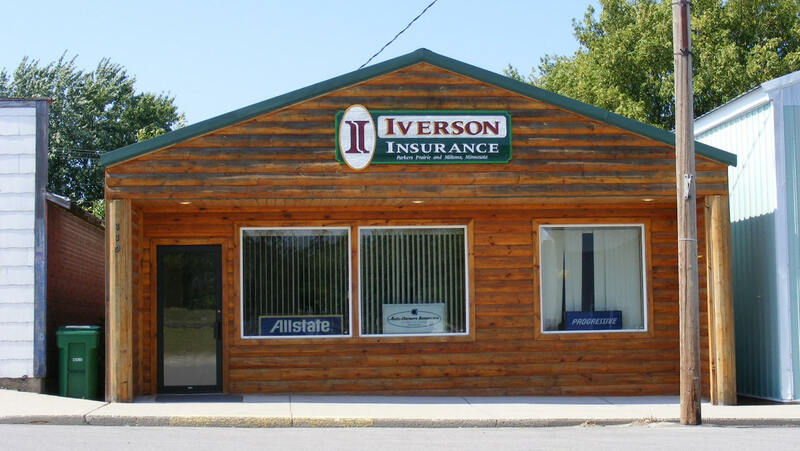 Open 7 Days a Week, 8:00 am to 9:00 pm. 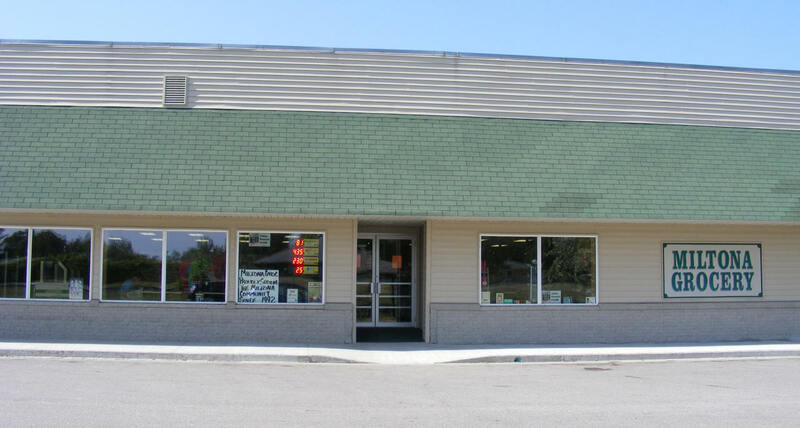 Full line of merchandise including Milk, Bread, Pop, Ice, Produce, Meat, Health & Beauty Care, Ice cream, Candy, Movie rental, Greeting cards, Tobacco products, ATM, Clothing. Open Daily – 6:00 am to 11:00 pm. 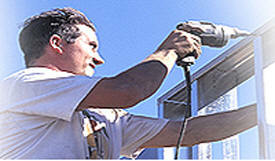 Full service residential plumbing, heating and air conditioning. 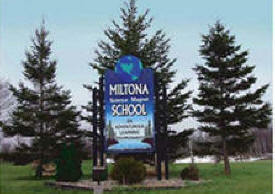 Home Games played at Bernie Steidl Field in Miltona. The season’s schedule is posted at the Field. 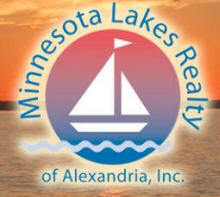 Minnesota Lakes Realty provides real estate services and information for buyers and sellers of lakeshore, farms, hunting land and residential properties. Experienced and Professional. f you treat your pet as though they were a part of your family and you can't imagine having to leave them while you're away on vacation...or for a few days... or during your workday, this is Pawsitively the Purr-fect place for them to be! “For All Your Concrete Needs” – “Family Owned and Operated”. 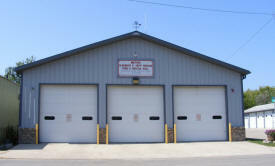 Crushed rock, Road base & fill, Washed material, Buckshot, Pearock, Concrete pumping, Colored concrete, Septic tanks. 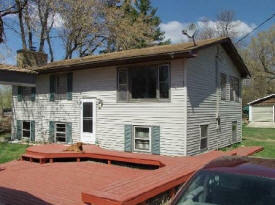 Sandy Beach Hideaway is a family owned home on Lake Miltona. 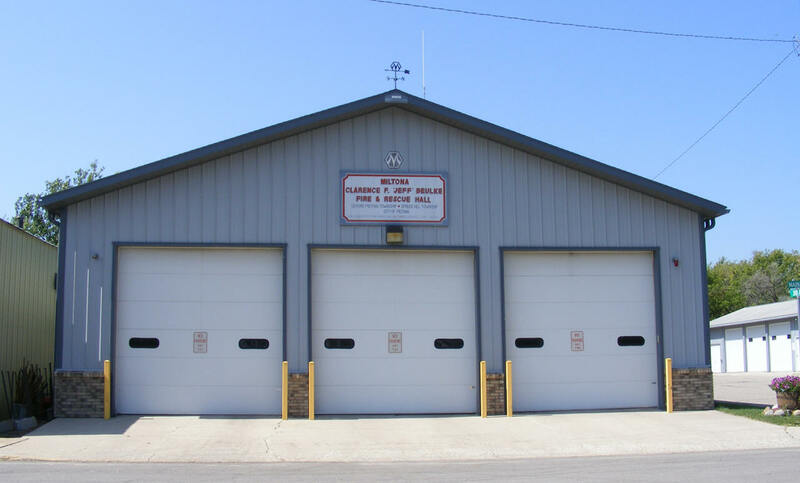 It is only 100 yards from Sandy Beach Public Access and Beach and is a great fishing lake, filled with Walleye, Northern, Muskie, Bass, pan fish and more. Spruce Creek Fish Farm is a full service fish farm catering to the needs of lake owners and wildlife organizations in the Midwest. We raise top quality fish fry and fingerlings for the stocking of ponds and bodies of water across the Midwest United States.